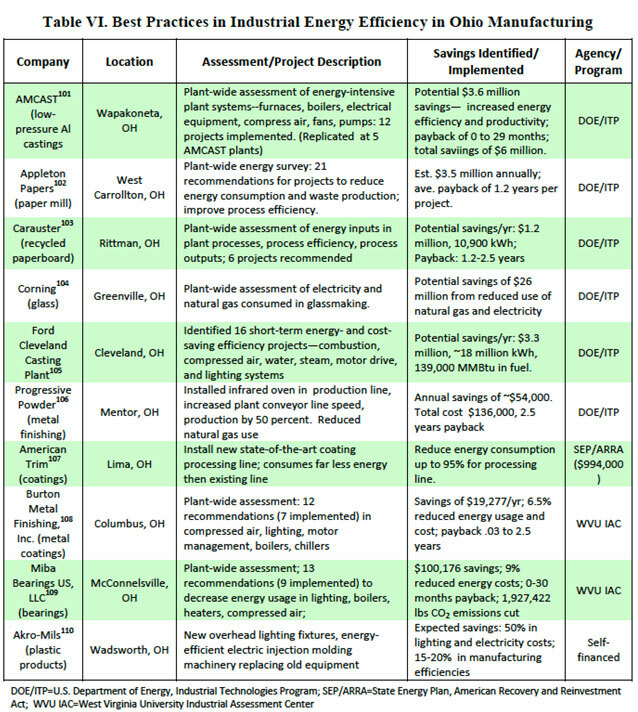 A related document to help manufacturers identify the best financial and technical assistance opportunities to make energy savings. These products were compiled into a single report for OMA. Shorter versions of each document were also developed that taken together served as an executive summary for the larger report. An IEE Roadmap. High Road Strategies was an active participant in most phases of this work. This included reviewing and evaluating the manufacturer interviews, and providing input into the other products produced by the OU team for OMA. 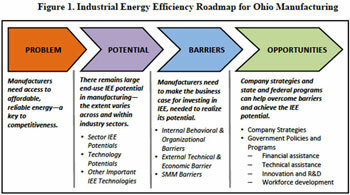 However, its primary contribution was in the production of the IEE roadmap, presented in a report An Industrial Roadmap for Ohio Manufacturers: Potential, Barriers, and Opportunities. 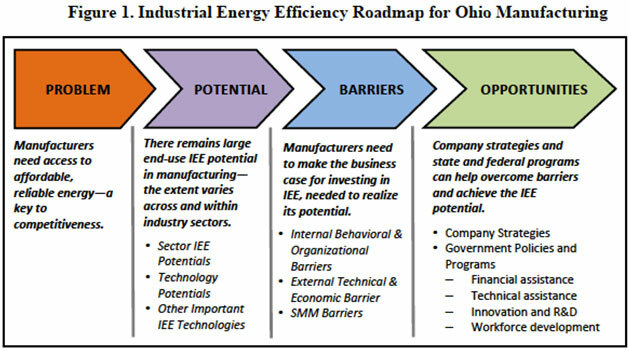 In sum, the report argues that in order to proactively pursue IEE improvements, Ohio manufacturers must identify the potential for making cost-effective IEE gains, assess the barriers (internal and external) to realizing this potential, and adopt business strategies and take advantage of public sector opportunities to overcome these barriers. 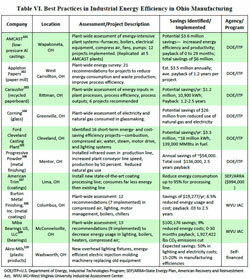 All manufacturers benefit from cost-effective measures that reduce their energy use and costs. For some types of manufacturers—i.e., energy-intensive (EI) manufacturing industries, such as iron and steel, primary aluminum, petroleum refining, paper, cement, among others—investing in IEEE is a higher priority than for non-EI industries, whose energy costs are a much smaller share of their overall production costs. Nevertheless, some major non-EI manufacturers—such as in auto manufacturing, aerospace, fabricated metal products, machinery—are concerned about energy use in certain energy-intensive operations and divisions within their facilities. In addition, small and medium-sized manufacturers have different considerations in assessing and making IEE investments compared to larger firms, especially in EI-industries. SMMs typically lack resources needed to overcome IEE barriers and realize their IEE potential. IEE Potential. 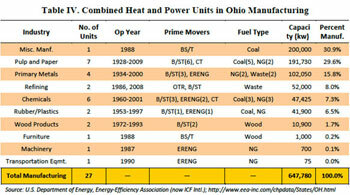 The report notes that American manufacturers lag in their IEE achievements compared to many foreign competitors. There especially is reason to worry about competing with nations such as China becoming more energy efficient, which already benefit from competitive advantages, such as low-cost labor, subsidies, and lax regulations. Nevertheless, the report notes that there is substantial potential for making IEE improvements in most U.S. manufacturing industries—and in Ohio, in particular. A large number of technologies are available for enabling cost-effective, short-, medium-, and long-term IEE gains. IEE Barriers. In realizing this potential, however, manufacturers confront a number of barriers. This includes internal company behavioral and organizational barriers (such as elevated “hurdle rate,” rapid payback requirements, capital constraints and lack of expertise). Managers must make the “business case” for justifying investments in IEE that will draw upon scarce capital resources. In addition, they must overcome external technical and economic barriers, such as capital availability—the largest single concern of manufacturers, and the availability of new technologies, processes and productions. IEE Opportunities. Finally, the report identifies many types of opportunities available to Ohio manufacturers that can help address these barriers and enable cost-effective IEE improvements. These include business strategies, such as developing plant and line-level energy management plans, workforce training, and involving engineering and front-line workers in the design and implementation of these plans. In addition, a large number of state and federal programs are available to manufacturers, both in Ohio and nationally, which can help reduce the costs and barriers to achieving IEE gains, by providing financial resources (grants, loans, tax credits), technical assistance, support for R&D and technology innovation, and workforce training and development. Although the report primarily focuses on IEE opportunities for manufacturers, it also notes that Ohio has been emerging as an important hub of clean energy manufacturing in the nation, and could pursue other clean energy opportunities to stimulate economic growth in the state. This was supported by a number of the interviews of manufacturing executives conducted by the OU team. For example, forward-looking Ohio firms are already engaging in producing products, materials, parts and components used in clean energy production, “green” buildings, advanced fuel vehicles, and “green” infrastructure and transportation. Given its tremendous manufacturing strengths and capacities, with supporting policies Ohio is poised to become a national center for multiple clean energy manufacturing clusters, supplying a wide-range of materials, parts and end-use products for local, domestic, and international markets. Tools for the Road. High Road Strategies also developed a second report, Tools for the Road: Helping Ohio Manufacturers Assess and Benefit from Government Energy Policies and Programs, that proposes several new follow-on projects, building on the work of this project and the earlier OU-OSU projects. In particular, it proposes the development of (i) energy-economic evaluation tools, to assess the impacts and opportunities for manufacturers associated with state and federal energy policies, and (ii) technical assistance tools, to help manufacturers to more effectively access and take advantage of state and federal energy-related policies and programs aimed at helping manufacturers achieve IEE gains. 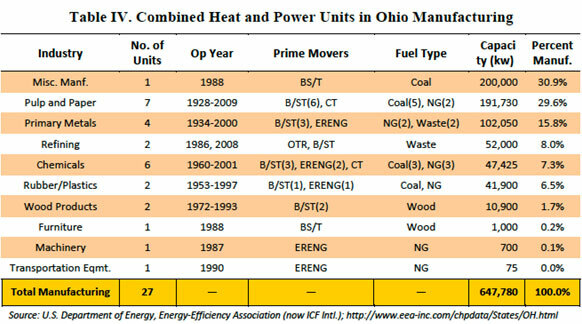 An Ohio Energy Policy and Manufacturing Competitiveness (EPMC) Evaluation Tool—a modeling tool, extending the Dynamic Energy-Economic Policy Simulation (DEEPS) model developed by the OU-OSU project, that would provide manufacturers with an easy-to-use, interactive, expandable, and empirically-grounded, analytical capacity for evaluating the potential economic impacts and implications of state and federal energy policies and regulations. Technical Assistance Tools for the Low-Carbon Road—an online resource that can guide manufacturers in the use of tools and resources available from federal, state and private sector sources, and assist their efforts to introduce cost-effective IEE and other low-carbon energy measures into their operations. Industrial Energy-Efficiency Investment Tool—a web-based analytical resource, constructed using System Dynamics modeling, designed to guide manufacturers in evaluating the cost-effectiveness of potential investments in energy-efficient technologies, equipment and processes in manufacturing operations.